An unsung story of the June general election was the impact of expatriate votes. Nearly one million Turkish passport holders – 29% of those registered – voted from their countries of residence, mostly in Europe, in the weeks leading up to 7 June. The overwhelming victor was the AK Party, which polled well above its in-country performance with just about half the overseas vote. But the pro-Kurdish HDP was a firm second, while the nationalist MHP languished in a distant fourth place. It was an important result because of the effect overseas votes have on the domestic result in Turkey. Unlike the French system, for example, Turkish expatriates do not elect MPs to represent them in the Ankara parliament. Instead, their votes are proportionally shared out among the 85 domestic electoral districts. These overseas votes are used to “top up” the votes each party receives within each district. If the result is running particularly close in a district, this can affect the overall result. With reports suggesting overseas turnout has reached 42%, considerably higher than June, expatriate votes are more valuable than ever. Every seats counts in an election like this one, where a couple of seats can make the difference between an AK majority or a hung parliament. 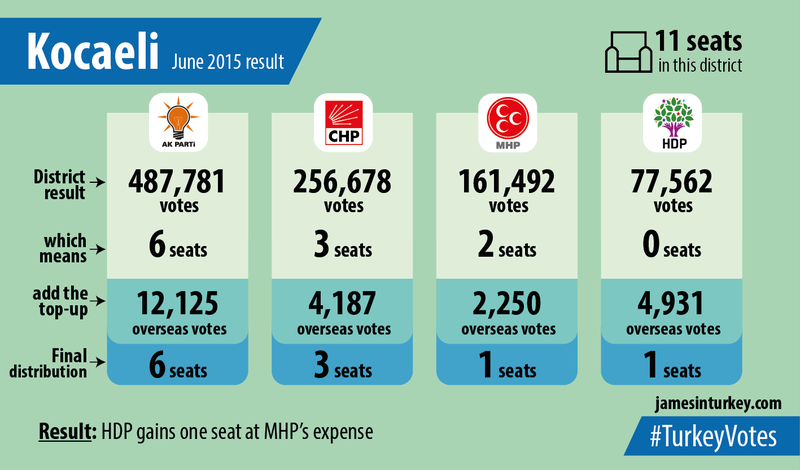 In June, seats in three districts changed hands because of the overseas vote: Izmir-2, Amasya and Kocaeli. Take Izmir’s second district. Without overseas votes, the CHP would have taken seven of the 13 seats available from this stronghold, leaving the AK Party with just three. AK needed precisely 900 votes to win an extra seat for itself – a pittance in an electoral district with 1.5 million registered voters. But AK’s strong performance overseas – and the CHP’s comparatively weak one – meant that it pooled three times as many top-up votes in the district. The final result: six seats for the CHP, four for the AK Party. There was a similar scenario in Amasya, where the MHP’s weak overseas performance caused it to lose its only seat in the district to AK. But the AK Party was not the only beneficiary of overseas voting. the northwestern industrial town of Kocaeli unexpectedly produced an HDP MP in June after its top-up votes pushed it marginally ahead of the MHP and deprived the nationalists of one of their two seats. The summary? 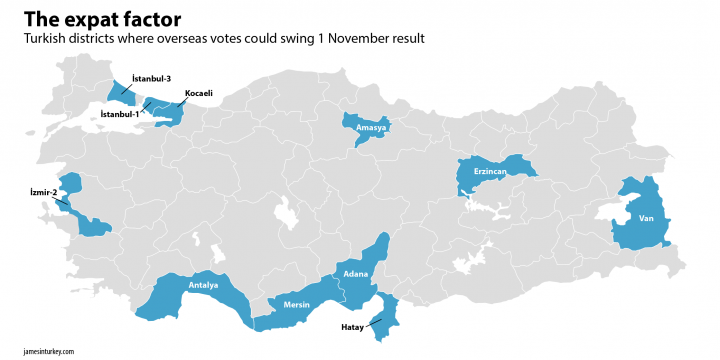 If your share of the overseas vote is higher than your domestic result – as with the AK Party and HDP – a few borderline results could swing your way. If your expatriate support is lower than it is at home – as with the CHP and MHP – you could lose out. Everyone will, of course, be watching Izmir-2, Amasya and Kocaeli this Sunday, where overseas voters swung the result last time. But the increased turnout this time around means there are other districts to keep an eye on. These are the places where the result was close, but not close enough for overseas votes to make a difference. Places like the eastern province of Van (0.5 million registered voters), where the AK Party was reduced to just one MP but could have won a second with just a few thousand more votes. The MHP lost out on a precious fifth MP from Istanbul’s first district (3 million voters) by a little over three thousand votes – a difference that exposed how few votes the nationalists collected outside of Turkey. 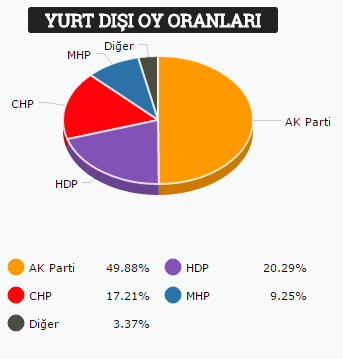 Then there’s Erzincan, where the CHP took one of the district’s two seats by just 959 votes. Overseas results did not swing the result in Turkey’s southern belt – Antalya, Mersin, Adana and Hatay – in June’s election. But all four parties are competitive in these provinces, such as Mersin (1.2 million voters) where just 45,000 votes separated the first-placed CHP and the MHP in third. A closer result in any of these districts could put the overseas vote into play.